While most people thinks interracial dating and marriages are wonderful as the saying goes “love who you love”, there are still those who hold some resentment when it comes to white women looking for black men. Some stars have been blasted by fans and haters alike for marrying outside of their own race, but that hasn’t stopped them from living their best life with the one they love. Check out White Woman Black Man couples who prove love is more than skin deep. The "Power" star married his wife Jennifer Pfautch in 2012 and they have two children together, but it seems some people aren’t on board for the interracial marriage. Back in 2014, a few people referred to his wife as ‘ugly’ and Omari took to Twitter expressing his frustration. In November 2015, Peele announced that he and Peretti were engaged. Peele cut right to the chase by simply tagging Peretti on Twitter and adding a diamond ring emoji. Modern love. Peretti also sent out a tweet about the good news. The hilarious couple tied the knot in 2016, just one year before Peele’s massively successful film, Get Out, hit theaters. 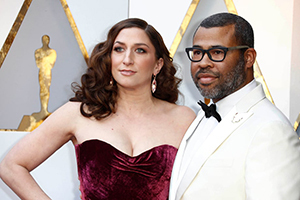 As the film centered on a Black man’s meeting with his White girlfriend’s family going horribly, horribly wrong, the couple have taken quips about their own romance in stride, with Peele jokingly saying the film was loosely based on is experience with Peretti’s kinfolk. Grey’s Anatomy star Ellen Pompeo married the music producer in 2007. 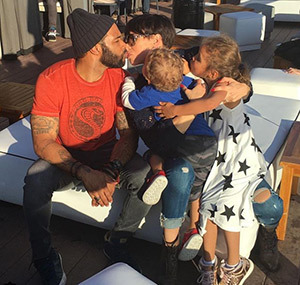 The white women black man couple share three children, Stella Luna Pompeo Ivery, 8, Sienna May Pompeo Ivery, 4, and Eli Christopher Pompeo Ivery, 1. 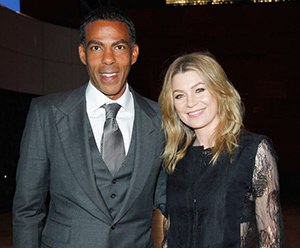 Ellen Pompeo and her husband, Chris Ivery, are one of those Hollywood couples that really doesn’t mind being photographed in public together. And fans love them for it, because they are so cute. Before Ellen was Meredith Grey (and before there even was a Meredith Grey), the love interest in Old School met Chris in 2003, in a grocery store in Los Angeles. Divorce rumors and cheating “scandals” have plagued Chris and Ellen ever since they got married in 2007. But the couple has stayed together despite all the gossip, and still seem to be going strong.